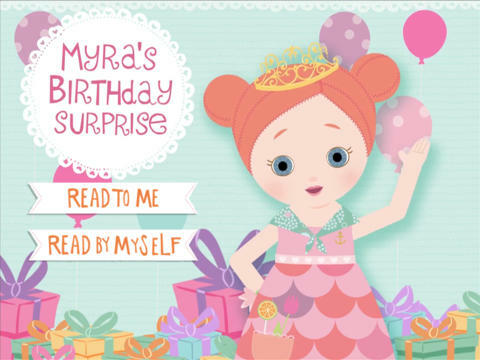 Myra’s Birthday Surprise is a FREE eBook that is available on iTunes and Amazon Appstore for Android to download. Today is a special day in Mooshka Village. It is Myra’s birthday, and her friends have planned to surprise her with presents, cakes and songs. But the magic of the Mooshka friendship has an even more adorable surprise in store for them all! Not sure who Myra from Mooshka is? They were once paper doll friends until one day they joined hands and through the power of friendship they sprung into sweet, huggable girls! Mooshka are soft dolls, each with their own unique name, birth date and personality. Ms C was quite concerned that the app didn’t load instantly. It does take a while though. Once loaded, you have three language options to choose from: English, French or Spanish. Once chosen, you are taken to the home page after a short introduction. You can choose either the book, puzzle or painting. This is an ebook where children can interact with the story to help with in-story mini-games. As for the story, you can choose to have the story read to you by a narrator, or you can read it yourself but unfortunately if your child gets stuck on reading a word, you have to help them to read out as there is no help in the app. The animation is beautifully put together and the background music blends in nicely. It is easy to navigate with left and right arrows to go backwards or forwards. It also has a house icon button to go back to the home page. There are also a few simple puzzles (6 or 12 piece) or four lovely pictures to paint. This is a lovely interactive ebook which will definitely appeal to preschool to year one girls. It contains no ads or in-app purchases and transmits no personal information. Do download and give it a try! It is free anyway, so no harm done! Disclosure: We will receive a doll in return for this honest review.